Are you new to running but have no idea how to start and ramp up in a safe, healthy and injury-free manner, which shoes to wear, dietary and nutritional changes required, etc? Do you wish to try your hand at triathlon? Do you aspire and dream of training for and becoming an Ironman (or may be a half-Ironman as the first step)? Have you run a half or full marathon but are looking for some expert and personalized coaching and mentoring to improve your performance? Are you an experienced runner/triathlete, but are unable to go beyond a certain level on your own? Are you aiming for a long-term goal like qualifying for the Boston Marathon? Are you looking to train for ultra-marathons like Comrades, Two Oceans, Bangalore Ultra or some other? Personalized Coaching: Personalized coaching for individual athletes. Sign up! Group Coaching: Belong to or wanna start a running group at your club, company or organization? Check out our group coaching. Running Workshops: Attend an upcoming running workshop or arrange one for your club, company or organization. 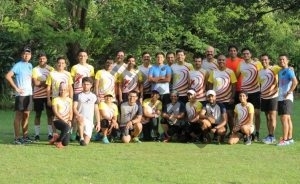 Motiv8 Coaching is started by accomplished athlete Atul Godbole, who is passionate about running, triathlon, and other endurance activities and believes that it is an excellent path to a healthy and fit lifestyle via continuous self-improvement. He is passionate about helping others achieve the same. Motiv8 athletes after a group run.